According to government advice, police have the power to stop and search individuals or their vehicles ‘if they have reasonable grounds to do so’. “You may be acting suspiciously, or trying to hide something, or be suspected of carrying an illegal substance or something that could be used as a weapon,” the NI Direct government website reads. “If you are stopped by the police and they want to search you, they must do it in a public place. You may be asked to empty your pockets, open your bag or take off your coat, headgear or gloves so they can make sure you're not hiding any weapons or stolen goods. However, in outlining its use of the powers the PSNI stated that in some circumstances ‘reasonable grounds’ are not required. “The police have a range of statutory powers of stop and search available to them, depending on the circumstances. Most, but not all, of these powers require an officer to have reasonable grounds for suspicion that an unlawful item is being carried,” a police statement read. “Some stop and search powers allow us to search people without grounds. For example it may be necessary to establish if they are in possession of munitions or wireless apparatus; or if there is a risk of serious violence or disorder. But in most circumstances police need grounds to search someone. “The one thing the powers all have in common is that they allow officers to detain a person who is not under arrest in order to search them or their vehicle for an unlawful item - this constitutes a stop and search. “Stop and search powers enable police officers to quickly allay or confirm suspicion about individuals without the need to first make an arrest. A police officer may ask a few questions before a search takes place, as this may quickly dispel any suspicion removing the necessity to carry out a search. “We are mindful of the impact that the use of such powers have on the community and we exercise and limit their use in a professional way to minimise any impact. We have processes in place to ensure that stop and search powers are used properly, legitimately and proportionately in preventing and detecting crime. According to Queen's University Belfast criminology lecturer Dr John Topping, the use of stop and searches in Northern Ireland is higher than in Britain and its return lower. "Approximately 16% of stop and searches in England and Wales result in an arrest," he said. “But when you look at Northern Ireland it is down to 7-8%. “We know that there are approximately 11 stops and searches per 1,000 people in England and Wales and with the Metropolitan Police there are about 20 stops and searches per 1,000. “When we look to NI there are about 20 per 1,000. Whilst that may not seem a lot at a superficial level, what it does point to is that there are proportionately a lot of stops and searches happening. Despite this, the PSNI has said that it does not pre-plan stop and search operations. “In terms of resources, we do not set up specific stop and search operations,” a statement read. 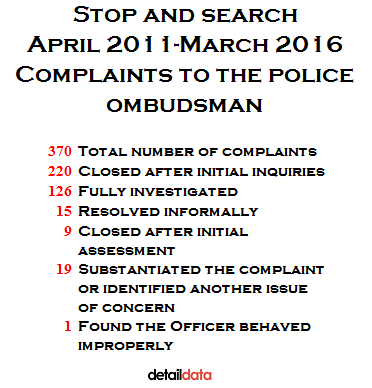 Despite the low level of follow-up police action following stop and searches, the Police Ombudsman’s office has received just 370 complaints over the last five years. In just one of these cases was it established that a police officer behaved improperly. “When looking at complaints from members of the public who have been stopped and/or searched, we will speak to them, to the police officer complained about and to any witnesses to the incident. “Sometimes there may also be mobile phone footage available. “We will also examine all the relevant documentation held by police, including the police officer’s notebook and any other material which may be helpful, including police radio transmissions and seek any other material which would explain why and how the search was carried out. “Between April 2011 and March 2016 this Office received 370 complaints about situations where someone had been searched. “126 of the complaints were fully investigated. In 19 of these cases we substantiated the complaint which had been made to us or identified another issue of concern. “In only one of those 19 cases did we find that a police officer behaved improperly. The officer had stopped and searched a person using the powers available under the Misuse of Drug Act after he had seen them leaving a certain premises. We found that the officer had shown an oppressive attitude during the search. “In the remaining cases our concerns centred on officers’ compliance with police policy and procedures. The two most frequent problems arose from their understanding of the relevant legislation and from how they completed all supporting documentation. “In one incident we found that a police officer had stopped two people but quoted different legislation to each of them in explaining why he had done so. “We investigated an incident when a police officer searched a member of the public using the powers available to him under PACE but concluded that the search had not been necessary: the likelihood of finding any prohibited items was low given that there had been no burglaries, thefts or criminal damage reported in the area at the time. “In one case, we found that police had conducted a strip search of someone although the warrant they had received did not authorise such a search. In another, we were concerned that a police officer had copied a document found when searching a car without being able to demonstrate the legal powers used to do so. To read the Detail Data investigation on stop and search in full click here.